Recently I bought a light grey below waist full sleeves shrug. I was searching for this one since two months and finally, I found it in one of the local shops. It looks so cool on me that I actually influenced my friends to buy shrugs. Also, it adds a little class to my clothes. Now even my mum wants one for herself :D.
You all might have seen Bollywood/Hollywood actresses wearing different kinds of shrugs in movies like for example Alia Bhatt in the movie Kapoor and sons. She is looking absolutely gorgeous in those shrugs. More recently Sonakshi Sinha wore a below waist black coloured full shrug in her album Dard Bedarda and just took the whole video to a new level. These will give you more of a chic boho style. You can wear it with hot pants or narrow bottom jeans. These come in embroidery and plain ones. If you are buying a shrug like this then you should have at least?one pair of hot pants and crop top for a perfect style statement. Suppose somebody gives me $50 dollars to shop clothes with matching Fringe Shrug. Well, I would first buy nice little denim shorts (something hot, eye-opener types ;)). Then I would move on to buy a white solid top and then at the end I would pick a navy-blue or blue fringe shrug to compliment my combo. I have made a little wardrobe, in case you like visual attraction. Talking about the chic boho style well it’s more of a cowgirl look and more detail on different fashion trends you can read my blog chic boho grunge. Now this one reminds me of king Akhbar’s era. Do you know the story of famous king Akbar and his beautiful Hindu wife Jodha? Anyways, it is not a history chapter, all I was trying to create a picture of Queen Jodha who wore something similar. This style of the shrug is more of a party going one. These come in shimmer shades and leather fabric. You can wear them with jeggings and boots. These are a really great way to show your assets (you know what I mean). Just mix and match to look the best. This one has really cute sleeves and gives you a chic look with short dresses and A-line skirts. You can also wear these with Capri jeans. This could really add up to your overall outfit. You don’t have to purchase something specifically for this one. Just put it on whenever you are going out on a casual meet up or party or just a walk in the park. It simply goes with everything. If I would have to suggest a look that goes with it, I would suggest Ankle jeans with a sleeveless white top and your shrug at the top. Something similar to the one shown in the image below. These go well with tank tops for a nice rainy day outing. Now this one is not too easy to carry. So buy these only if you know the right colour combinations otherwise, it will ruin the whole outfit. I would suggest you spend some time on Pinterest. ?If you do not know what Pinterest is then I must tell you that Pinterest is the hub for ideas. This is where I spend my time whenever I need to find something for myself. Do some searching by yourself and find yourself a perfect combo. The one I showed in the image above is what you should be targeting. The girl in the picture has the perfect body build to go with Shawl Collar Below Waist Shrug. ?You will have to try and look for the best match. Amazon is undoubtedly the best place to try as many outfits you want. A quick search on the Amazon?panel will do. These are short ones. They again come in different fabrics. You can wear a lacy front pointed shrug with Chudidaar salwar-kurta or a Patiala. Wearing a denim fabric shrug with a short dress would make you more admirable. All these shrugs are available in different colours and fabrics. You might find it difficult to get one of these in your local market but there are hundreds of them available online. 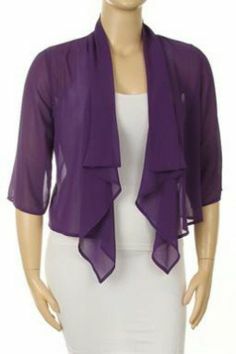 So go get a shrug today and create your style statement with it. Feel free to comment below with any doubt, suggestion, recommendation. I would love to add it to the list. I hope I have solved the queries and gave you a nice overview of different types of shrugs that you can instantly buy from Amazon by clicking on the image. Let me know your thoughts. Interview Attires for Men - How to dress for an Interview?